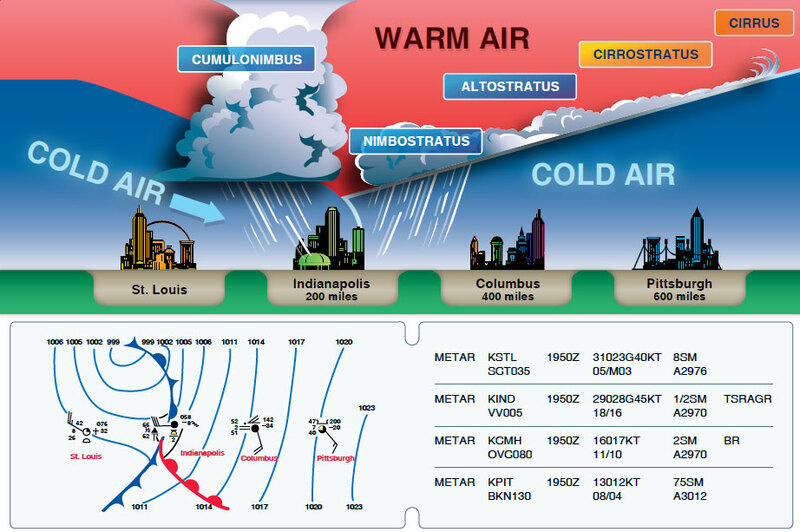 Warm fronts and cold fronts are very different in nature as are the hazards associated with each front. They vary in speed, composition, weather phenomenon, and prediction. Cold fronts, which move at 20 to 35 mph, travel faster than warm fronts, which move at only 10 to 25 mph. Cold fronts also possess a steeper frontal slope. Violent weather activity is associated with cold fronts, and the weather usually occurs along the frontal boundary, not in advance. However, squall lines can form during the summer months as far as 200 miles in advance of a strong cold front. 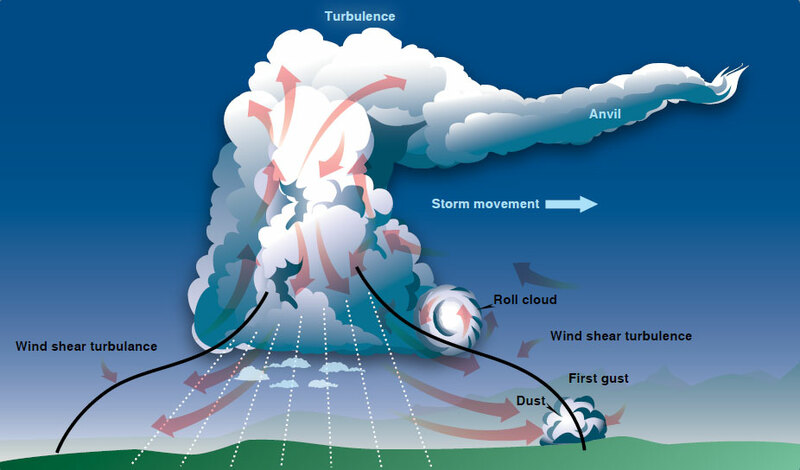 Whereas warm fronts bring low ceilings, poor visibility, and rain, cold fronts bring sudden storms, gusty winds, turbulence, and sometimes hail or tornadoes. Cold fronts are fast approaching with little or no warning, and they bring about a complete weather change in just a few hours. The weather clears rapidly after passage and drier air with unlimited visibilities prevail. Warm fronts, on the other hand, provide advance warning of their approach and can take days to pass through a region. Wind around a high-pressure system rotates clockwise, while low-pressure winds rotate counter-clockwise. When two high pressure systems are adjacent, the winds are almost in direct opposition to each other at the point of contact. Fronts are the boundaries between two areas of high pressure, and therefore, wind shifts are continually occurring within a front. Shifting wind direction is most pronounced in conjunction with cold fronts. An occluded front occurs when a fast-moving cold front catches up with a slow-moving warm front. As the occluded front approaches, warm front weather prevails but is immediately followed by cold front weather. There are two types of occluded fronts that can occur, and the temperatures of the colliding frontal systems play a large part in defining the type of front and the resulting weather. A cold front occlusion occurs when a fast moving cold front is colder than the air ahead of the slow moving warm front. When this occurs, the cold air replaces the cool air and forces the warm front aloft into the atmosphere. Typically, the cold front occlusion creates a mixture of weather found in both warm and cold fronts, providing the air is relatively stable. A warm front occlusion occurs when the air ahead of the warm front is colder than the air of the cold front. When this is the case, the cold front rides up and over the warm front. If the air forced aloft by the warm front occlusion is unstable, the weather is more severe than the weather found in a cold front occlusion. Embedded thunderstorms, rain, and fog are likely to occur. Figure 12-27 depicts a cross-section of a typical cold front occlusion. The warm front slopes over the prevailing cooler air and produces the warm front type weather. Prior to the passage of the typical occluded front, cirriform and stratiform clouds prevail, light to heavy precipitation falls, visibility is poor, dew point is steady, and barometric pressure drops. During the passage of the front, nimbostratus and cumulonimbus clouds predominate, and towering cumulus clouds may also form. Light to heavy precipitation falls, visibility is poor, winds are variable, and the barometric pressure levels off. After the passage of the front, nimbostratus and altostratus clouds are visible, precipitation decreases, and visibility improves. It is impossible to fly over thunderstorms in light aircraft. 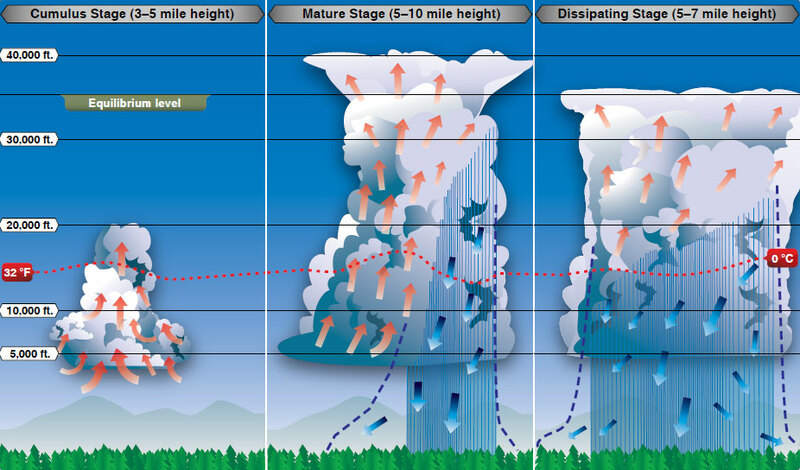 Severe thunderstorms can punch through the tropopause and reach staggering heights of 50,000 to 60,000 feet depending on latitude. Flying under thunderstorms can subject aircraft to rain, hail, damaging lightning, and violent turbulence. A good rule of thumb is to circumnavigate thunderstorms identified as severe or giving an extreme radar echo by at least 20 nautical miles (NM) since hail may fall for miles outside of the clouds. If flying around a thunderstorm is not an option, stay on the ground until it passes. Knowledge of thunderstorms and the hazards associated with them is critical to the safety of flight.